PHOSPHOR Ana-Digi Watches With E Ink Display | OhGizmo! With display technologies like OLED and SED promising rich, life-like colors, it’s kind of funny to see a black and white technology like electronic ink becoming so popular. And yes, I realize that color e-ink displays are inevitable, but they won’t be hitting the markets for a few years at best. In the meantime though B&W e-ink displays have started to invade everything from cellphones to watches. The PHOSPHOR Ana-Digi Watch combines a traditional analog clock face with hour, minute and second hands, with a digital e-ink display on the face. 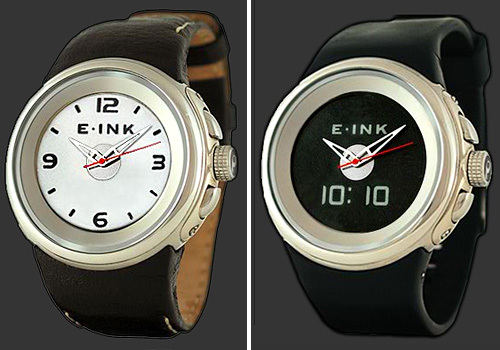 The e-ink can be used to show an analog clock face, a digital version of the time or a series of other faces at the push of a button. It’s a nifty idea but I could do without the word ‘E-INK’ that’s included on every face. To me that’s like buying one of the new SONY OLED TVs and having the word ‘OLED’ sitting in the middle of the screen at all times. I get it! It’s e-ink! I don’t need to be reminded whenever I check the time. The PHOSPHOR is available for $250 and comes with your choice of a leather or polyurethane band. Yeah, like every time I look at the bottom of my laptop screen, it says “DELL”. I get it, it’s a Dell, I don’t need to be reminded whenever I look at the screen. Quit your whining. How many watches don’t have a logo on the face? Ever hear of something called branding? HA HA! Good one Andrew. I think the idea is that it is playing on the idea that it is an electronic ink watch, which just happens to be the same as the brand? Not sure, but maybe the software can turn the logo on and off.